The expansion of commerce in the Ottoman world necessitated the introduction of new types of buildings to accommodate various trade types. The han or caravanserai consisted of cells arranged around a courtyard, providing all the amenities the traveller needed. It contained a mosque, shops, stables, barn, and sleeping rooms. The second major commercial building is the bazaar or bedesten, evolving around the traditional suq neighbouring the main mosque. The expansion of commerce in the Ottoman world necessitated the introduction of new types of buildings to accommodate various trade types. As with other building types, the Ottomans also inherited the han or caravanserai keeping much of its functional and formal properties. The general plan consisted of a number of cells and units arranged around a courtyard, providing all the amenities the traveller needed. It contained a mosque, shops, stables, barn, and sleeping rooms. According to Sanderson, Fatih complex had a rectangular plan caravanserai of one hundred cells destined for travellers. Another example of these caravanserais includes the caravanserai of Coban Mustapha Pasha complex (1524) which consisted of a domed entrance, halls, sheds, barns and stables. From this, one can conclude that the function and location of such a small building complex resemble very closely modern service stations along the motorways, but providing free service. In this concern, it is worth noting the need for further study to investigate whether there is any connection between the caravanserai and modern motorway service stations. At a later stage, the above charitable function ceased to exist as the caravanserais were incorporated into the urban environment where they were converted into commercial depots often used as wholesale centres selling particular goods. The Ipek Hani built by Mehmed I, for example, was a centre for silk merchants. The Pirinc Hani (1507), the Fidan Hani, and the Koza Hani (1489), all in Bursa, were mainly markets for grain such as rice and others. Other hans were used as storage centres for merchandise, while others kept animals. 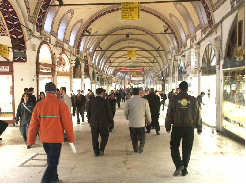 The second major commercial building is the so called bazaar or bedesten. It is a corrupt word coming form bezitan which means a cloth market, a market selling textiles. The bedesten evolved around the traditional suq neighbouring the main mosque. It is a covered hall raised on pillars and surmounted by domes. It has usually a longitudinal plan of between two and three bays wide and up to eight bays long pierced with at least two easily accessible gates. The bedesten provided a safe and protected place for merchants, according to Kuran, as primitive type of Banks where the tradesmen left their goods for the safekeeping. The bedestens were usually locked at night and usually have caretakers (security men). This market hall is where goods are sold, usually aligned in large wooden crates with lids that could be opened during business hours and closed at the end of the day. These run along both side walls allowing the pedestrian movement in the middle. Goods such as silk, jewellery, spices and other valuable products are sold there. Sometimes shops were opened at the external walls of the bedesten providing more commercial space as seen in Buyuk bedesten, built in Istanbul by Al-Fatih in 1470, which had 44 shopping cells inside and 64 outside. The example of Istanbul Kapali Carsi, which consists of two market halls going back to Mehmed II and Suleyman the magnificent, shows that the bedesten can cover an area of up to 30 hectars incorporating numerous shopping alleys and khans. Sanderson, J. (1931, 'The travels of John Sanderson in the Levant, 1584-1602', ed. Foster, London, p.70. Eyice, S. (1955), 'Istanbul: Petit Guide a travers les Monuments Byzantins et Turcs', Istanbul, p.127.